Need a wide load transported across Northwestern Canada? Let Truckways Transport Ltd smooth the way for you. With more than 40 years’ experience in pilot car service and traffic control, Truckways Transport Ltd will ensure safe traffic control procedures and smooth transportation of your oversize load to its destination. Our radio-equipped vehicles and fully insured drivers are always reliable and on time. Truckways Transport (1977) Ltd has been in business in the northern part of Canada and Alaska since the company’s inception in 1967 and reorganization in 1977. Truckways Transport is here to make your oversize experience as safe and enjoyable as possible with our knowledgeable and courteous staff. 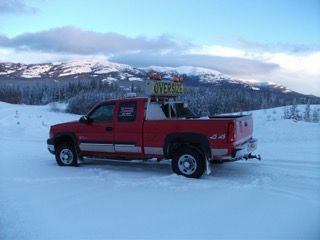 Truckways Transport serves The Yukon, Northwest Territories, Alberta, Northern BC and Alaska. Our company is founded on a genuine passion for driving and a commitment to getting oversized loads to their destinations safely. We have a great team here at Truckways Transport, which is why our customers keep coming back. We hope you’ll join them and give us a call. Perhaps most importantly, you can always rely on our honest quotes. Call Truckways Transport Ltd the next time you need an oversized load hauled across the highways of Northwestern Canada. We’re ready to serve you.